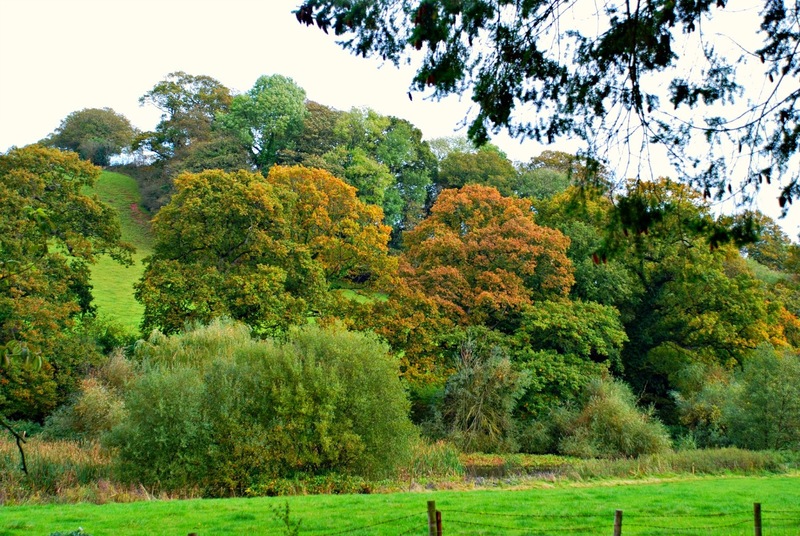 We've come to Devon for the half-term holidays, and it's all looking very autumnal down here. The weather's been pretty balmy for the time of year so most of the trees are still wearing a full compliment of leaves, but with the new-season's colours coming to the fore. And happily Hurricane Gonzalo has blown through without doing us any damage. It was very atmospheric being tucked up in bed listening to him howling outside. There's something especially delicious about being able to snuggle under the duvet, and let the weather do its worst. Normally, in my work-a-day existence, I'd have been out there, coated and booted, battling through the worst of it. 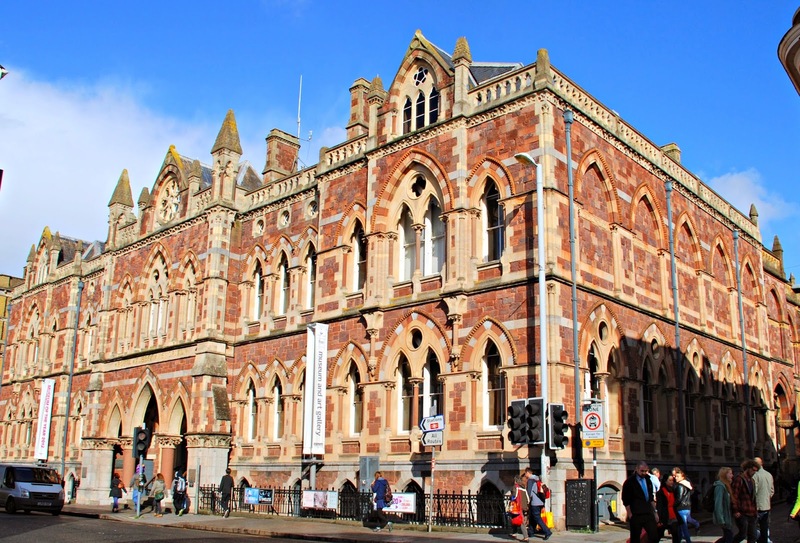 Emi has been given a half-term assignment on the Roman conquest of Britain, which has taken us into Exeter, or Isca Dumnoniorum, as those wily old centurions would have known it, to search them out in the Royal Albert Memorial Museum. 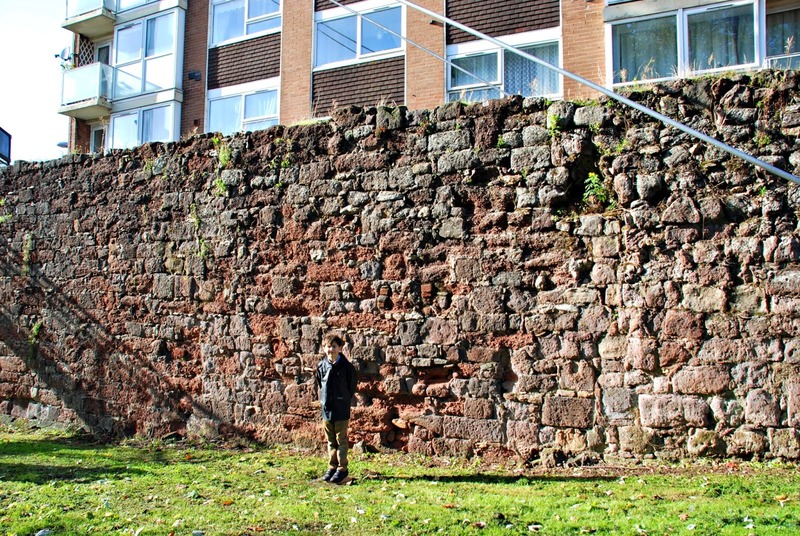 Exeter was on the very edge of the Roman empire. It was their most South Westerly garrison in mainland Britain. The city walls, of which about three quarters survive today, were originally built by the Romans. They enclose an area of roughly 42 acres and give us the outline of the old Roman city that was established in 55 AD. Of course, over the years, there have been fix-ups and repairs with the result that a lot of the stones on top are medieval. Here's a shot of the city walls. Ah, if only those old bricks could talk, what a tale they'd have to tell us. Here's another one, taken on the way back to the car park, with Emi standing in front for perspective. They believe that the Second Augustan Legion was garrisoned here from 55 to 75 AD. The Second Augustans had been part of the original invasion force, arriving during the Claudian landings back in 43 AD, when England had first been invaded by Rome. They were commanded, here in the West Country, by the future Emperor Vespasian. They've excavated their barracks (under the Guildhall Shopping Centre) and their massive stone-built bathhouse, which stood on Cathedral Green. Here's Emi busy taking photos in Cathedral Green so that he can write about where the Roman baths used to be. Apparently the baths were huge. They were supplied by a local spring, piped in using an aqueduct, and could have accommodated several hundred guys at the same time. They were supposed to have been more advanced in design than many of those back in Italy, and were certainly way ahead of anything in either Pompeii or Herculaneum. The archeologists reckon that this is one of the most important Roman sites in the country and are pretty enthusiastic about digging it all up again. The only problem is that the baths are literally at the front door of the Cathedral. The Dean and Chapter and the City Council are putting their heads together to see what, if anything, can be done. I don't envy them their task. It's going to be a tough one excavating and showing off the Roman baths without destroying the appearance of the magnificent Cathedral. Back in the museum we found some touching bits and pieces. One of my favourites was this broken cup, which still shows its owner's name. 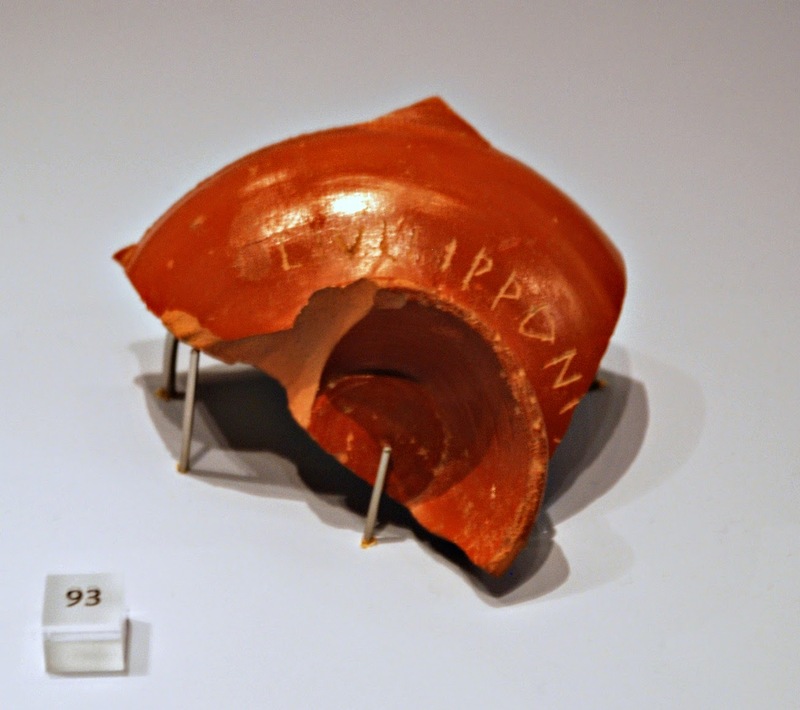 OK, so it's not the most exquisite piece of porcelaine ever to see the light of day, but it's kind of thrilling to read this guy's name, Lucius Julius Hipponicus, scratched down the side. They reckon that he was a soldier, who lived here in 55 to 65 AD. Whatever the way of it Lucius Julius Hipponicus is one of the earliest residents of Exeter whose name is still known today. Some of the soldiers died during their time in the city and their cremated remains have also been unearthed, together with an assortment of personal effects and food and wine with which they were buried. It seems to have been the practice to provide a little bit of sustenance to get the deceased started in the afterlife. 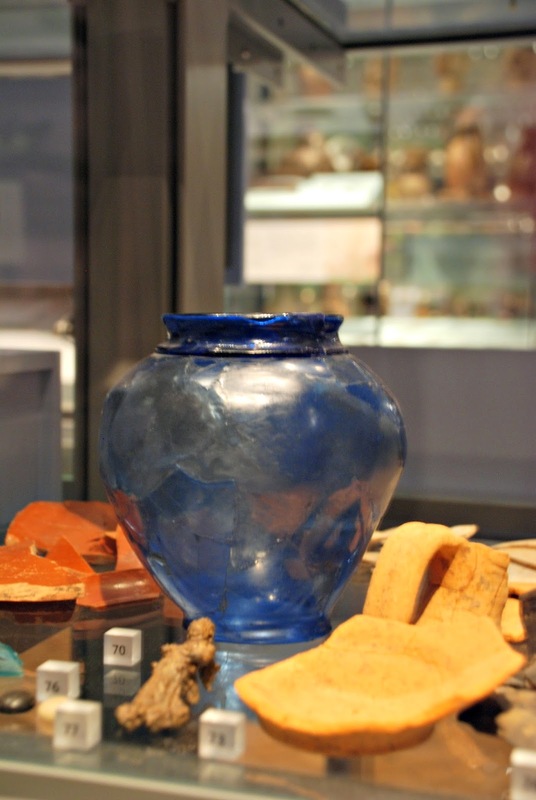 The amazing German glass jar in the photo below was included in one such burial. It must have been one of the dead soldier's most prized possessions. 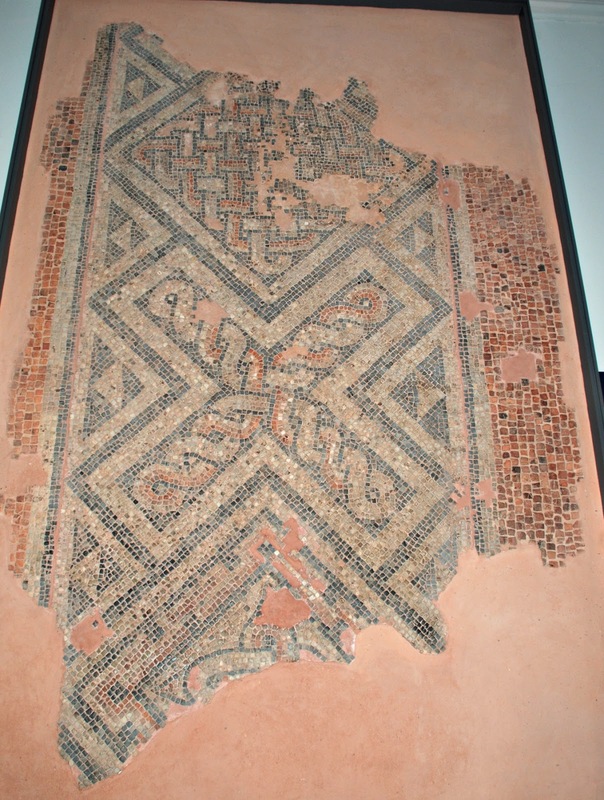 I was amazed by how well it's survived for the better part of two millennia, and I was also slightly humbled to behold someone's favourite thing from all that time ago. 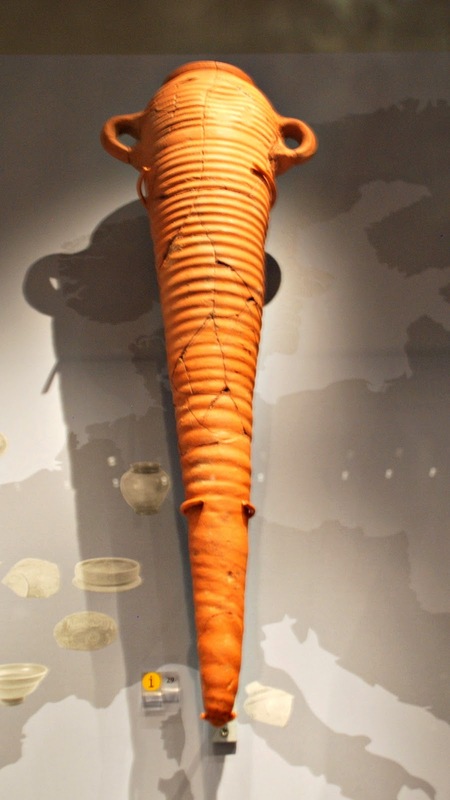 Emi was impressed with this lovely carrot amphora in which a soldier had been sent some exotic fruit. It's a nice touch to see how the Roman soldiers enjoyed care packages courtesy of their Roman mums and wives back at home. 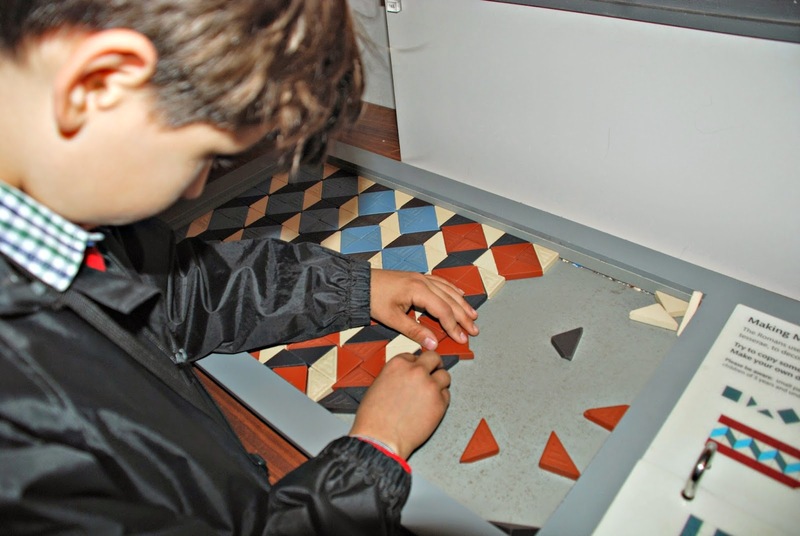 Emi thought that it would have made a very fine receptacle for an obscene amount of jelly beans, but we wont' go there ... .
Then we had a go at laying some mosaic flooring, which was a bit like doing a jigsaw. But, as luck would have it, there was one that someone else had made earlier - about two millennia earlier. 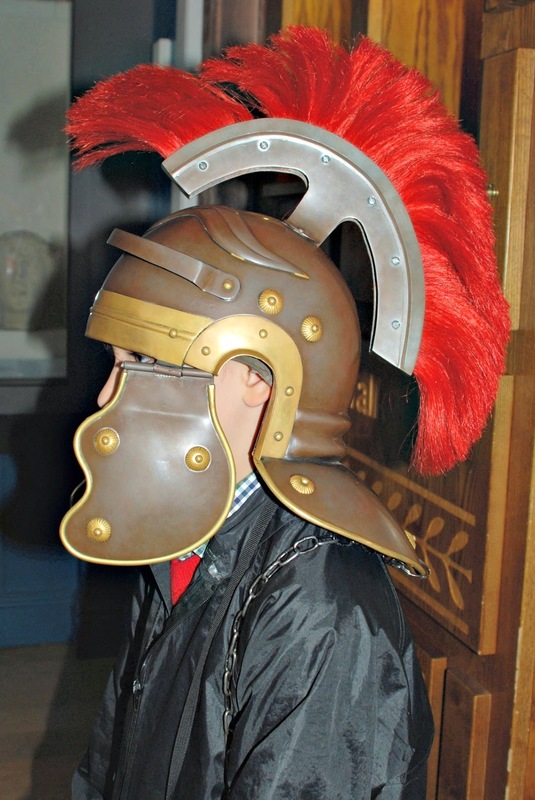 And we got to lark around in the museum dressing-up box. How scary is this fierce centurion? He certainly thought he was the business with his mohawk helmet. 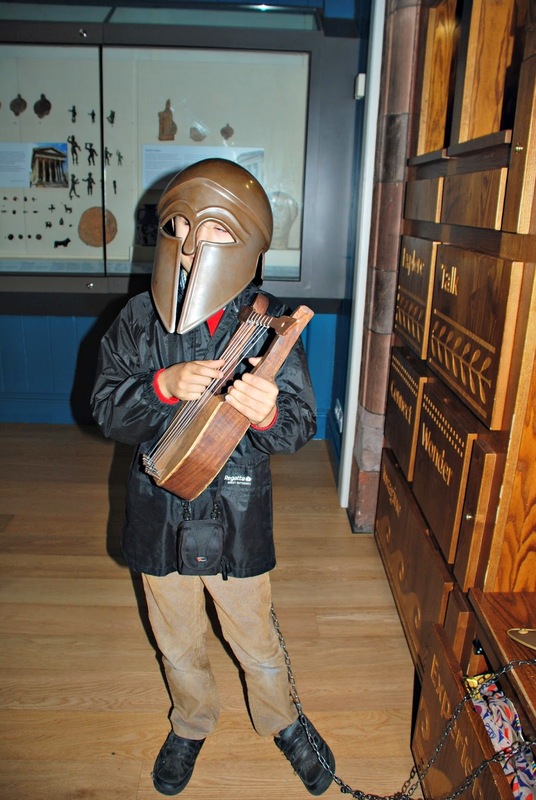 But after a while we went a bit off-piste with a Greek helmet and lyre. Although I must say I think it's a winning combo ... the singing Spartan anyone? It's fair to say that there's not a lot of Roman Exeter on display, but with a bit of imagination, some colouring pencils and a spot of googling Emil will hopefully have enough material for his assignment. 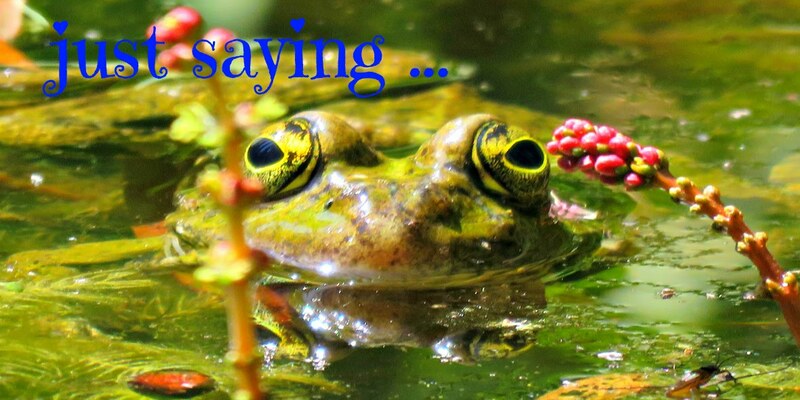 Great post, fun and full of information. But most of all, I like the way you write. You have to tell me what they will do about uncovering the baths. 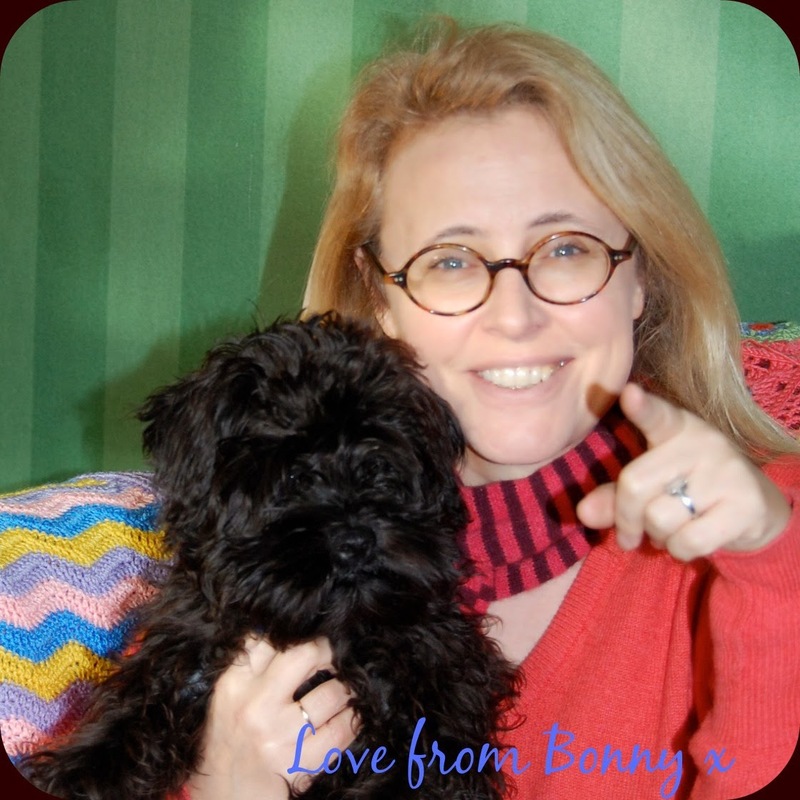 Bonny we only live half an hour from Exeter ! I love the museum it has won various awards I believe. While I found Roman baths gorgeous, I don’t think I would risk that beautiful Cathedral excavating near it. Happy Friday to you too, Kia. Yes, I agree with you. It would be lovely to see the Roman baths, but if it were to be at the risk of losing the charm of the Cathedral that would be too high a price to pay. It's a really tricky one.